Simon & Schuster, 9781451691733, 352pp. In a "sophisticated international thriller" (The New York Times Book Review) from "a fresh voice in crime fiction" (Kirkus Reviews), antiques dealer-turned-PI Jim Brodie takes on an elusive group of killers hunting for a long-lost treasure with a dangerous history. After wading through the tragedy of San Francisco's Japantown murders, struggling antiques dealer Jim Brodie is back in Japan for a well-earned vacation. But checking in at the PI firm Brodie inherited from his father, he immediately acquires a new case: a Japanese World War II veteran shows up and spins a dark story connected to the war and a pair of violent home invasions committed in the Tokyo only days earlier. Brodie agrees to provide protection for the old warrior, but soon an unexpected murder shocks him and his crew, and they begin a wild ride through the worlds of war atrocities, Japanese kendo clubs, the backstreets of Yokohama's unfathomable Chinatown, and Chinese spies. With the crusty PI Noda at his side, Brodie pokes around where he's not wanted, and when a friend is delivered up to him in pieces Brodie is once again running for his life--while seeking the answers he needs to save it. 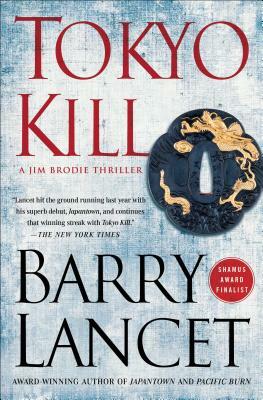 Barry Lancet "imbues Tokyo Kill with a vivid sense of Japan, from sections of Tokyo that only a native would know about the meticulous research into the country's history and legends...Lancet hit the ground running...with his superb debut, Japantown, and continues that winning streak with Tokyo Kill" (The New York Times/AP).